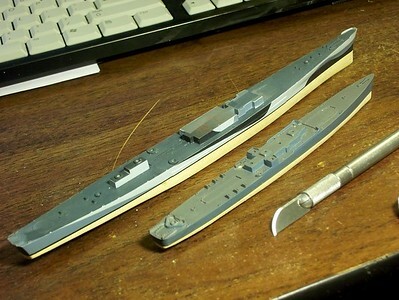 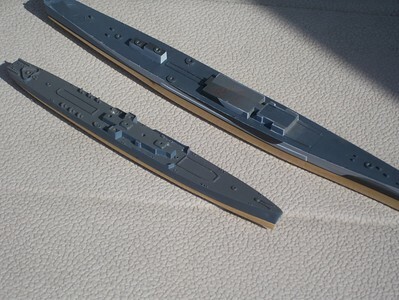 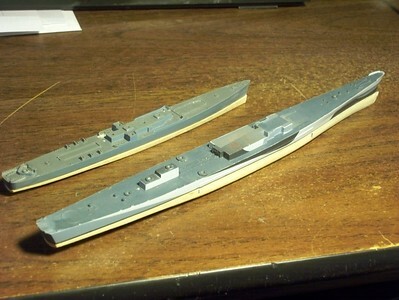 USS San Juan (CL-54) in 1/700 scale from Skywave kit of USS Atlanta (CL-51). 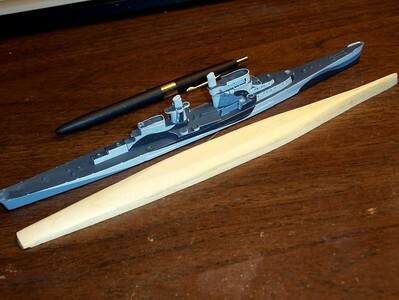 Bottom hull scratchbuilt from basswood. 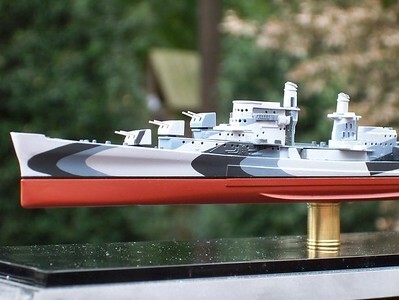 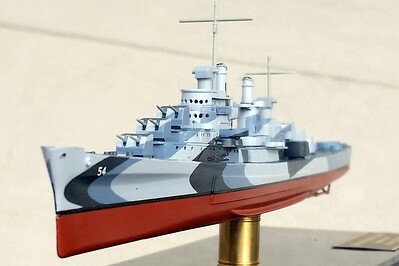 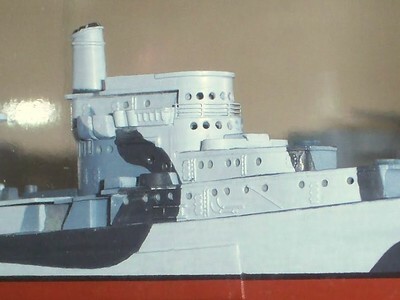 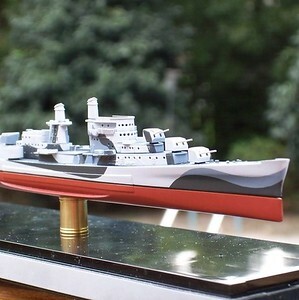 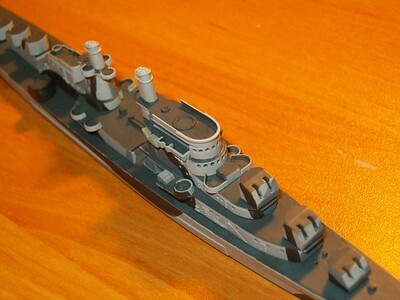 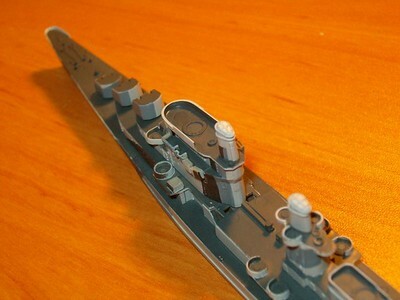 USS San Juan (CL-54) (1/700 Skywave Atlanta) showing corrected pilothouse and flying bridge. 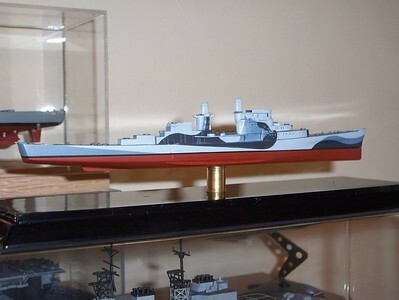 090328 USS San Juan (Skywave Atlanta class) displaying her basswood undersides. 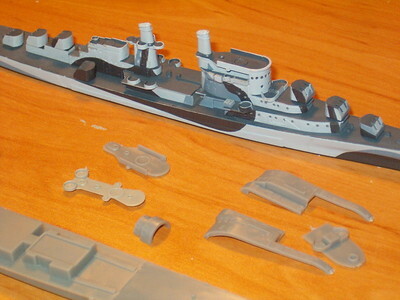 Needs running gear (next rainy day project). 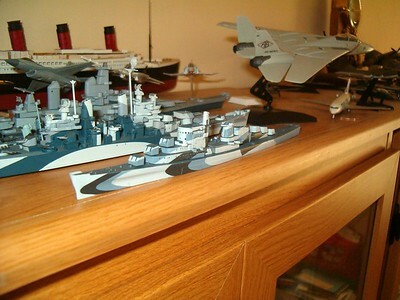 090328 Top to bottom: Skywave Fletcher, Skywave Atlanta class, Tamiya Indianapolis, all 1/700 scale. 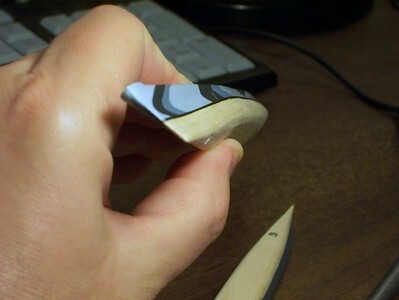 Hulls are carved out of basswood to eyeball standards. 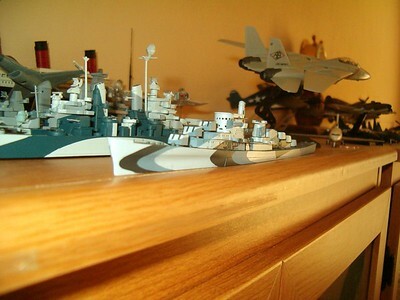 090326 Top to bottom: Skywave Fletcher, Skywave Atlanta class, Tamiya Indianapolis, all 1/700 scale. 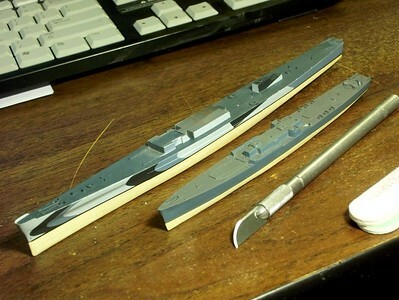 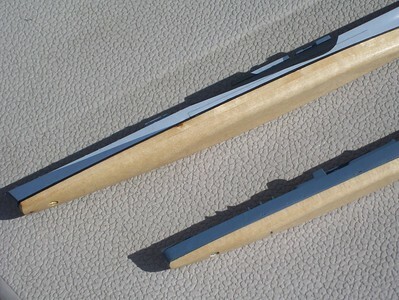 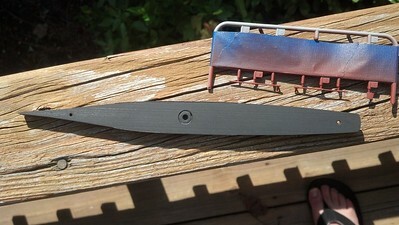 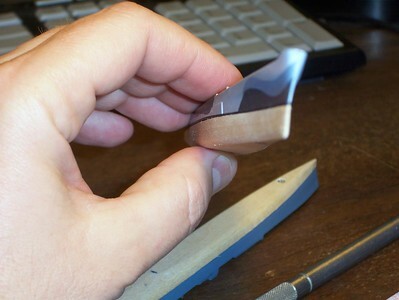 Features added to Indy of Styrene strip. 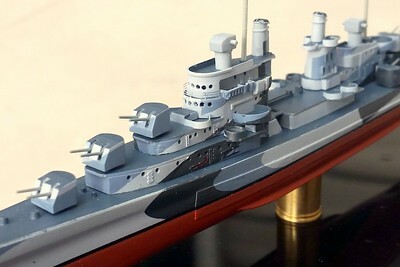 Note bulbous bows on top two, built-up with CA. 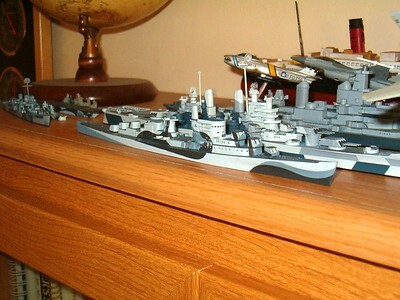 Top to bottom: Tamiya Indianapolis, Skywave Atlanta class, Skywave Fletcher, all 1/700 scale. 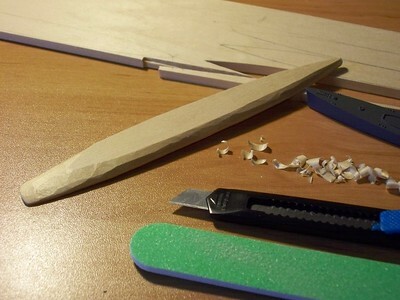 Hulls are carved out of basswood to eyeball standards. 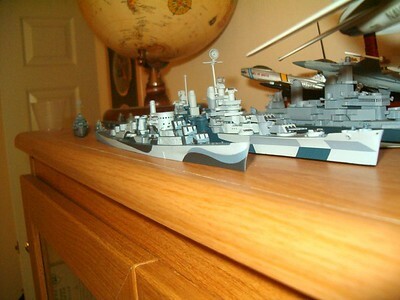 090322 Top to bottom: Tamiya Indianapolis, Skywave Atlanta class, Skywave Fletcher, all 1/700 scale. 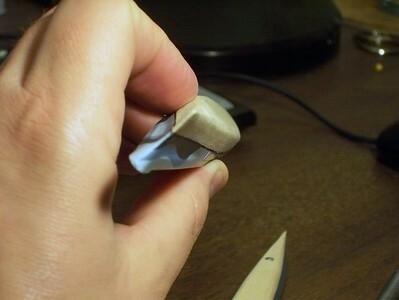 Hulls are carved out of basswood to eyeball standards. 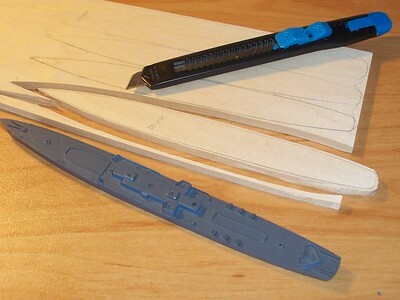 090311 Basswood bottom for USS San Juan (CL-54). 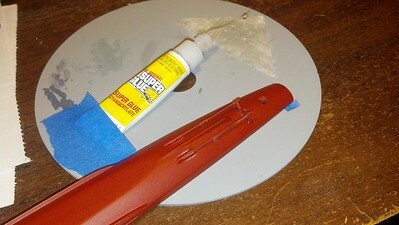 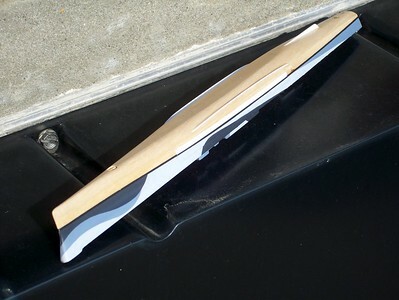 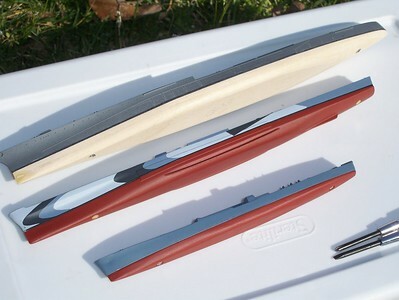 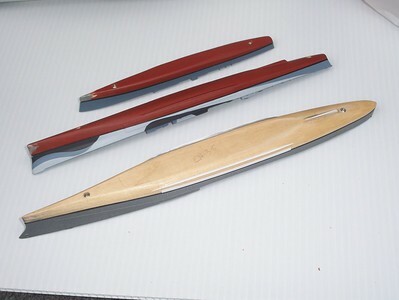 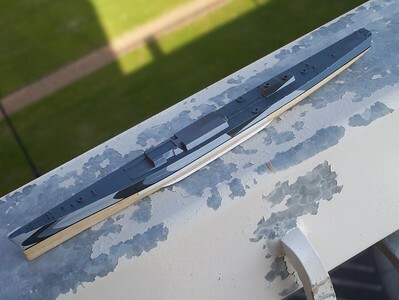 Armour belt, bilge keels and skeg added from styrene sheet, secured and faired with thin CA. 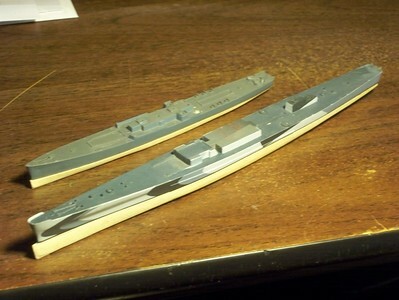 090307 Basswood bottoms for USS San Juan (CL-54) and Skywave Fletcher. 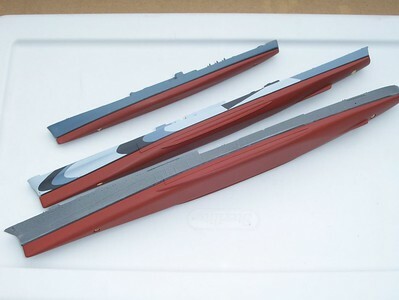 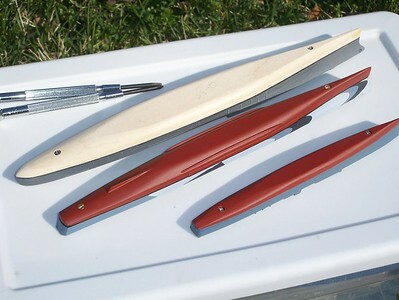 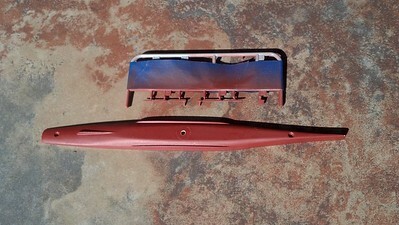 Coated with spray varnish (clear gloss). 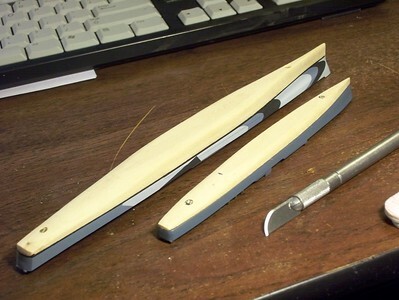 090210 Carving and shaping. 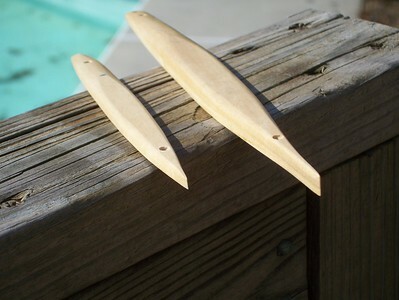 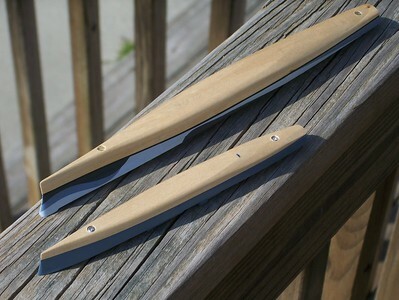 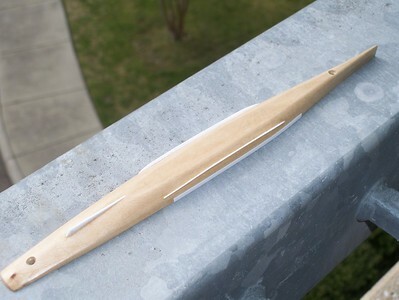 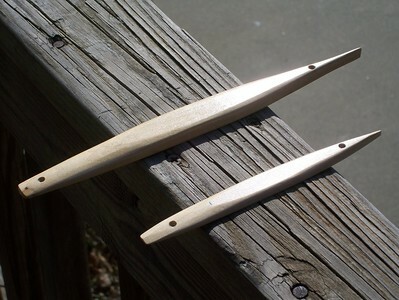 Basswood prefered over Balsa, which is too soft and course-grained. 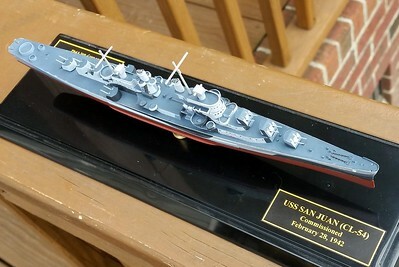 060927 USS San Juan (1/700 Skywave Atlanta). 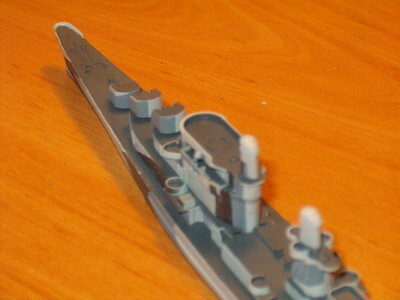 Corrected, narrower flying bridge. 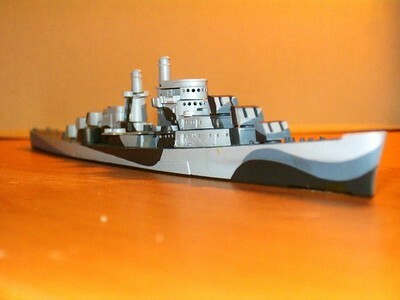 060927 USS San Juan (1/700 Skywave Atlanta). 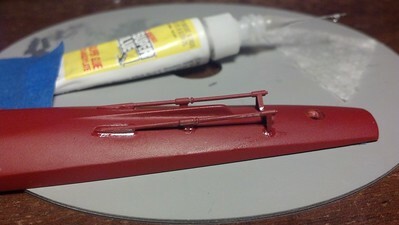 Corrected, narrower flying bridge in paint. 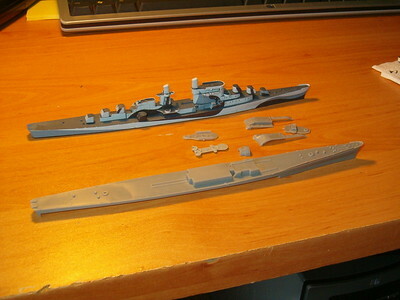 Needs cleanup. 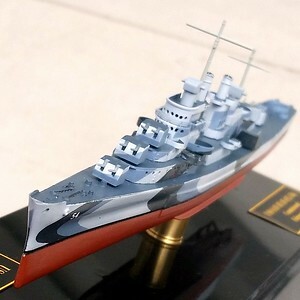 060917 USS San Juan (1/700 Skywave Atlanta). 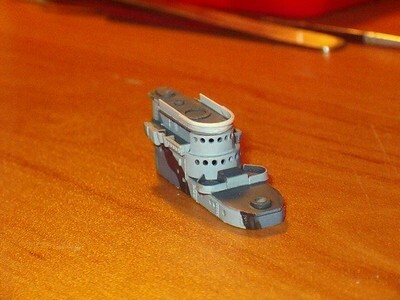 Pilothouse is oversized - Flying bridge should be narrower, following contour of smaller pilothouse. 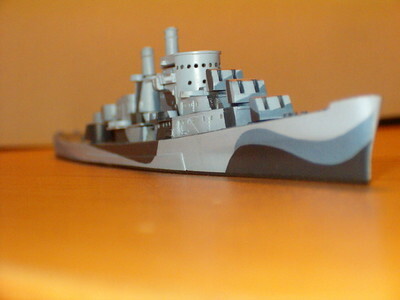 060917 USS San Juan (1/700 Skywave Atlanta). 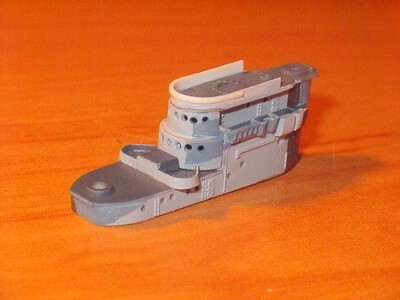 Pilothouse is oversized - should have exterior walkway as in original Atlanta.